Don’t be like me and let being hot be the only tell-tale sign of dehydration. It certainly is a contributor, but there are other factors, too. Being dehydrated is a loss of water, or rather, not drinking enough water. So, how will you be able to tell? If you are thirsty it’s already too late. You don’t have enough water in your system. If your mouth is dry, again, you don’t have enough water intake. If you feel fatigued, that is a sign. Your cells and muscles and other body systems need water to function efficiently. Headaches can be another symptom of dehydration. Do you have a headache because you didn’t eat? Maybe. But many times it is because you are not drinking enough water. Last, there’s dizziness. Water, like food, needs to be replenished in the body or we may get dizzy. So, how do you know you are getting enough water? Well, the easiest way is to notice the color of your urine. Ewww! Gross. Well, it’s true. The darker the color, the less amount of water is in your body. The lighter, the better. This is an easy gauge. As for the recommended amount to drink…it varies from one source to another. The recommended amount according to The Mayo Clinic is eight 8-ounce glasses a day. That’s 64 ounces. Nowadays, we have refillable plastic/metal containers that range from 8 to 20 oz. The larger the container you have, the less number of glasses you have to drink. I have a 20 oz. container. It would take at least three and a half full containers full to equal that amount daily. There are plenty of resources, including apps, that track water intake. 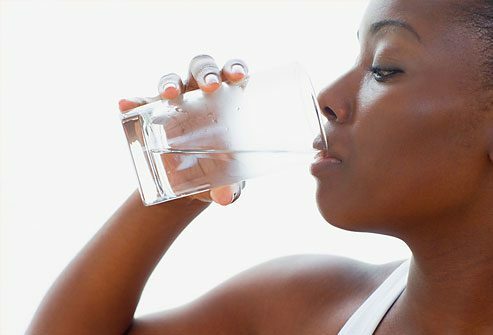 If you are in the habit of drinking water consistently, you may not need an app. You just know when to drink. But those of you who are less likely to remember will probably need something to remind you until it is a habit. So, drinking water daily is as important as eating food. You and your body need it. Drink up!